My favorite McKay so far! This gentle story of two generations of a family spending the summer at the beach and their little (mis)adventures has the timeless feel and of great children's literature. As always, McKay is superb at creating rich, believable characters in an amazingly small number of words and making us care about even the less likable ones.However, cat-story lovers should be warned that there is no actual cat in this book. Love that Hilary McKay. The Amber Cat is the second of an older trilogy of hers-not quite the length or laugh-riot of the first book, Dog Friday, but still a fun, sweet story. Robin Brogan and his mom, along with their friends and neighbors, are characters worthy of multiple books, and I enjoyed reading about them again. Sun Dance is one of my favorite characters in the Porridge Trilogy, and he had some great lines and scenes this time around. Glad there's one more to read before I have to say goodbye to these characters. Hilary McKay is one of my favorite children's authors.Robin Brogan doesn't mind having chicken pox nearly so much since his friend Dan has it too. Mrs. Brogan invites Dan to recover at their house since his mother works outside the home. Mrs. Brogan and Robin live at Porridge Hall, her childhood home, which is now a beachside Bed and Breakfast inn.Just when Robin and Dan are getting bored, Sun Dance, Robyn's younger next door neighbor, gets spots too and is allowed to visit. After television, games, and reading, the boys begin telling ghost stories. Sun Dance is very susceptible to ghosts. He's personally acquainted with many.Mrs. Brogan tells them about summer visitors she had when she was their age. She and her visitors spent all but the rainiest days playing on the beach across from Porridge Hall. The three friends together were more than enough for her poor mom and dad, but her parents didn't know that their time at the beach was being enlivened by their new friend Harriet. She had more ideas than even Nick, the most fearless and luckiest of the group. One of those ideas put Nick in grave danger.The Amber Cat is a companion book to Dog Friday and Dolphin Luck which also take place at Porridge Hall. It's also a wonderful ghost story, told with wit and humor and populated by captivating characters. Unusually for Hilary McKay, a ghost story. A pretty classic children's ghost story, with the ghost covering several generations. Very mysterious and satisfying. Sara and I are working our way backwards through her earlier books while waiting for the next one. 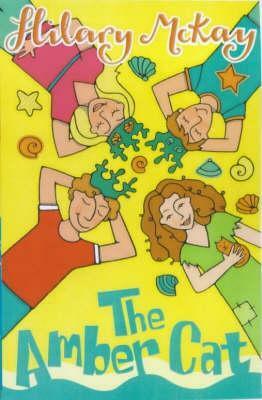 I remember reading this book several years ago (I was probably around 12/13) and loving it! I liked McKay's writing. The story was a very well-told mystery and I will now be able to recommend this little tale to students! Dit is, naast De regenboog heeft maar acht kleuren van Peter Pohl, toch wel het aller- aller- allermooiste boek dat er bestaat. Ik ken het haast uit mijn hoofd maar het gaat me nooit vervelen. I thought this was a great adventure book for children. I initally was hesitant to read it, but I really got into it as I read it. I think most children can empathize with the ones in this book. Hilary McKay - Hilary McKay was born in Boston, Lincolnshire and is the eldest of four girls. From a very early age she read voraciously and grew up in a household of readers. Hilary says of herself as a child "I anaesthetised myself against the big bad world with large doses of literature. The local library was as familiar to me as my own home. "After reading Botany and Zoology at St. Andrew's University Hilary then went on to work as a biochemist in an Analysis Department. Hilary enjoyed the work but at the same time had a burning desire to write. After the birth of her two children, Hilary wanted to devote more time to bringing up her children and writing so decided to leave her job.One of the best things about being a writer, says Hilary, is receiving letters from children. She wishes that she had written to authors as a child, but it never occurred to her to contact themHilary now lives in a small village in Derbyshire with her family. When not writing Hilary loves walking, reading, and having friends to stay.